When I first used HPLC back in 1998, I was always told by my supervisor that the column pressure should not exceed 200 bars; otherwise, the column might be irreversibly damaged. In addition, the column temperature should be adjusted around room temperature, which was not exactly specified. Some HPLC systems were not even equipped with a column heater, because temperature was not considered a very important parameter. Two years later, I started using high-temperature LC. 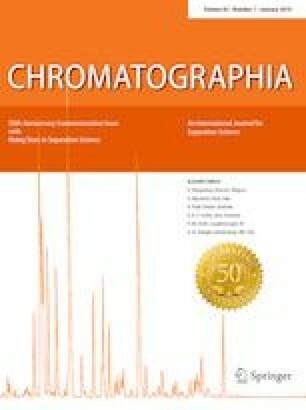 Two articles that were previously published in Chromatographia greatly influenced me. The first one which was entitled “Buffered Superheated Water as an Eluent for Reversed-Phase High Performance Liquid Chromatography” was written by Orapin Chienthavorn , who, at that time, worked under the supervision of Roger M. Smith. For me, Roger was one of the true pioneers in HPLC who brought some new ideas into the field. Should it really be possible to use just water at very high temperatures (up to 200 °C) to perform green chromatography and therefore get rid of toxic organic solvents? Orapin applied a temperature gradient starting from 70 to 190 °C for the separation of selected sulfonamides. The first experiments I designed were conducted using an old GC oven, as was also suggested in that publication. I recall the fascination when I performed my first truly high-temperature separation of selected antineoplastic drugs with a water-only mobile phase. I soon realized that special equipment would be needed to further push the technology. Using a GC oven always made it necessary to use a very long preheating capillary to preheat the mobile phase. If this capillary was too short, band broadening was observed which resulted from a thermal mismatch between the incoming mobile phase and the stationary phase. In addition, a longitudinal temperature gradient might be formed within the column. Orapin used a 100 cm-long preheating capillary to overcome that problem. However, such long preheating coils also led to band broadening because of the high extra-column volume. Therefore, I wrote my first research proposal on the development of a specially designed heating system for HPLC to perform fast-temperature gradient programming in liquid chromatography. At that time, the proposal was threatened to become rejected by one of the reviewers, but in the end, everything turned out to be working. We finally succeeded and also found a company that was interested to commercialize this device. The second paper which made a deep impression on me was written by Ian Wilson and was entitled “Investigation of a Range of Stationary Phases for the Separation of Model Drugs by HPLC Using Superheated Water as the Mobile Phase” . Still, the weak point in high-temperature LC was the stability of the stationary phases when using a hot mobile phase. Ian investigated in detail the various types of stationary phases that might be used for high-temperature LC. The paper offered a good insight into new materials, like, e.g., polymer-coated phases based on zirconium dioxide. In the following years of my PhD thesis, I also used these materials, which not only offered a different selectivity than the “traditional” silica based RP phases, but also showed superior temperature stability. Ian also used the PGC phase which gives a very high retention even for polar analytes that are difficult to trap on the conventional RP phases. When we first met during a dinner at the ISC 2004 in Paris, we discussed the pros and cons of that material. During the following years, I was able to acquire some more research projects to examine all aspects that were important for a routine use of high-temperature LC. With the advent of hybrid materials that were originally developed to resist very high pressures, we had a new gold standard.